Recently I read an reviewed His Texas Forever Family. 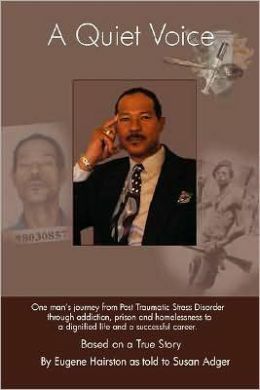 Shortly after reading the book, I had the opportunity to interview the author! 1. Your debut novel His Texas Forever Family is Harlequin’s September 2014 Special Edition® release. That’s incredible! What’s going through your head right now? To be honest, I’m a little overwhelmed. As a new writer, I’ve worked hard to put together the absolute best book I can at this point in my career, but it’s scary knowing that not all readers will love my story. Falling in love with a book is such a subjective thing, and it’s almost impossible to please everyone—something that every author knows when that book hits the (physical and virtual) shelves. Being new, I haven’t yet gone through the experience of reading reviews from people who don’t like what I’ve written, and I imagine it’s not a great feeling. All that any writer can do is write her very best book at any given time, and hope that each subsequent book will get better and better as her writing and storytelling skills improve—I just keep reminding myself that this is enough. 2. How has your Harlequin experience been? Do you hope to write more for them, pursue other ventures, or both? Harlequin has treated me very well and yes, I do hope to continue writing for them. 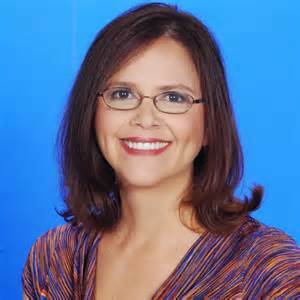 I love my editor, Carly Silver, which makes things run really smooth. She and I get each other and she understands my writing and my goals for each story, which makes the process of readying each book for publication a pleasant experience. I do plan to venture into indie (self) -publishing at some point, but I want to write for Harlequin as long as they’ll have me. 3. This is a romance novel, do you plan to stay in the genre or get your toes wet in another area of the book community? For now, I’m very happy writing romance. I also love to read cozy mysteries, and at some point, I’d love to spend more time learning the craft of writing one and try my hand at that genre. Lots of cozies have a romance subplot, as well, so at least I would have that part down. 4. What authors influenced your writing of this book? I’ve spent a lot of time reading Nora Roberts’ old category romances—the ones she wrote long before she was the romance writing icon that she is now. 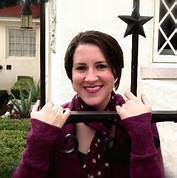 When Roberts started writing category romance, she broke a lot of the genre’s conventions with her strong, intelligent, independent heroines that often had very interesting or unique careers. I’d love to follow in her footsteps with my heroines. And, let’s be honest, who wouldn’t want a career like hers? Roberts worked hard to build a readership and to make a name for herself—actions I very much admire and hope to emulate in my own romantic fiction career. 5. What authors do you generally read? What is your favorite genre? I read widely—both genre and literary fiction—anything from scifi to biography, and I love it all. I’m not sure I could choose a favorite. I think it’s important for writers to read both in and outside of their genres, to stay open to new ideas and new worlds. 6. In addition to your budding writing career, what else do you have up your sleeve? Right now I’m just concentrating on keeping up with my contracted book deadlines, and promoting my debut release. In the near future, I’m planning to write and self-publish a new series, in addition to continuing to write for Harlequin. 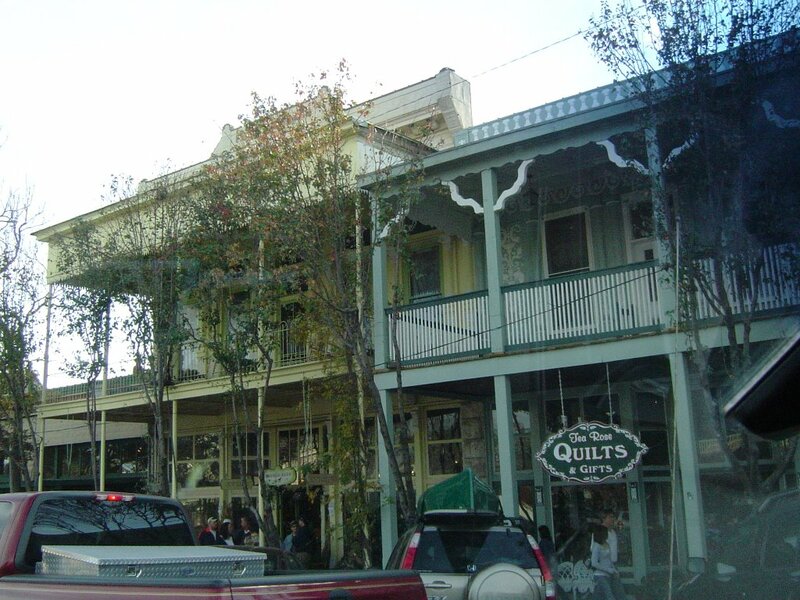 Although the book’s setting, Peach Leaf, Texas is a fictional small town, it’s loosely based on one of my all-time real favorite places—Fredericksburg, Texas. Fredericksburg is a town in West Texas with a population of a little over 10,000, and was founded in 1846 and named after Prince Frederick of Prussia. Both Fredericksburg and Peach Leaf are home to several amazing German restaurants boasting excellent beer and mouth-watering Reuben sandwiches, and Pioneer Museums that share artifacts and tons of information about the towns’ intriguing histories. As for the school setting—I was a teacher myself for a bit, though I taught high school rather than elementary. 8. What made you choose Texas as a setting? I chose Texas mostly for the low risk of messing up. I’ve lived here my whole life, so I figured for my debut novel, I’d better stick to what I know best. I plan to travel, do some research, and branch out a little in the future, but Texas will always be in my bones. 9. 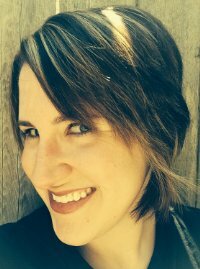 What brought you into the writing world? What got you writing? I’ve always loved to read and I think, like many, for me writing was a natural response to having enjoyed so many books. I’ve always written here and there, but, despite a degree in English, I never considered making a career out of it until I found myself in a job I loathed and needed a creative outlet. Once I started writing frequently, I fell in love with the process, and eventually decided to submit some work. 10. What is one thing you would like your readers/fans to know about you? That I’m pretty easygoing and open. I love hearing from readers and I’m always happy to answer questions about the writing or publishing process, and to help out when I have something to offer. Readers are always welcome to contact me via my website. 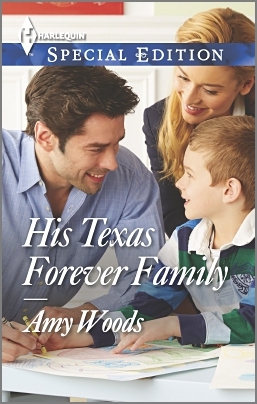 For additional information on His Texas Forever Family, please visit the Books page on my website, or find me on Facebook as Amy Woods Books, or on Twitter as @amywoodsbooks. Thanks so much for having me as a guest today! Periodically, Anakalian Whims interviews authors and artists for the public. This blog having such a friendly relationship with Grey Gecko Press has allowed for more author interviews than I could have ever dreamed for, and here’s one more. 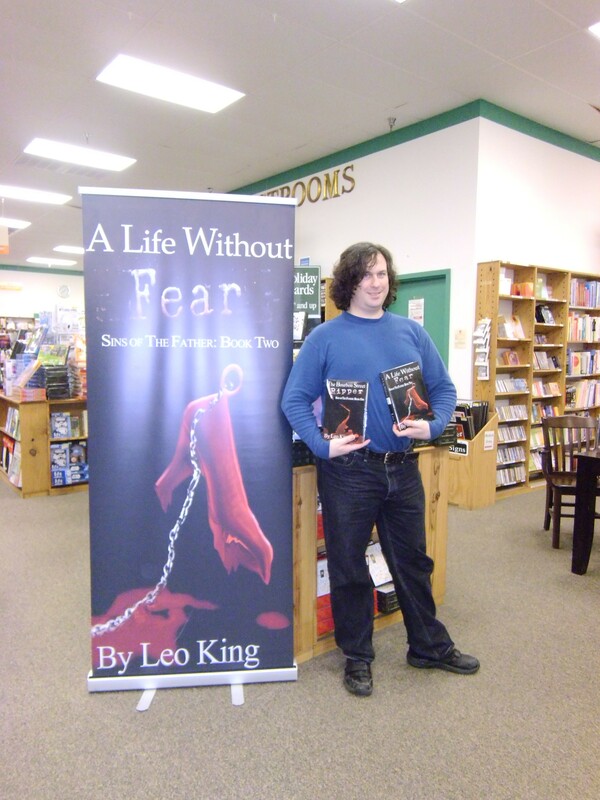 Meet Leo King, author of the Sins of the Father trilogy. 1. You have a 3.95 average rating on Goodreads for The Bourbon Street Ripper, sounds like people generally like it! (The first few pages creeped me out and I’m holding off until I can muster a non-scaredy cat reading mood out of myself to finish the book.) Tell us a little about your series Sins of the Father. Sins of the Father is a genre-bending trilogy. While it’s thriller throughout, it starts as a a murder mystery and changes into what could almost be called urban fantasy. The voodoo culture undertones in the beginning become more prevalent as the three books go on. 2. What brought you to the murder/mystery/thriller genre? Is it merely what fit this story or is it your chosen genre? My chosen genres are actually sci-fi, urban fantasy and epic fantasy. However, I’ve always wanted to write a trilogy that mutates genres in a seamless fashion. Most of this is because I want to show that it can be done. Put enough information in the story to inform the reader, and you can go from mystery to supernatural or fantasy to science fiction, etc. While it’s not recommended all the time (fans of one tend to favor it over the other), there are occasions when it can be very entertaining. This is my only attempt at genre-bending. I will not do it again. I also will likely never write pure modern-day mystery. It’s not something I think I’d enjoy. I might try a hand at science-fiction mystery some time. I love thrillers though, and will likely continue in the supernatural thriller and serial killer thriller genre in the future. I think I kind of got away from your question. Sorry about that. The genres of Sins of the Father fit the story. 3. Who are your favorite books and authors? Ultimately whose writing career inspires you most? American Gods by Neil Gaiman is my #1 favorite for modern authors. Otherwise, anything by Asimov for science fiction, Weiss and Hickman for fantasy, and Stephen King for thriller/horror. My favorite old-school novel is Lord of the Rings. 4. 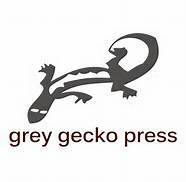 You’re published through Grey Gecko Press. How has that experience been for you? I’ve enjoyed the freedom I get with GGP. They put the author’s desires first and foremost. I consider GGP a great starting place for any author. 5. Although you’re a Houston local, I see in your bio that you’re not a Houston native. How do you think your Louisiana roots and life experiences have affected your writing? I grew up in New Orleans, the birth place of the modern romantic vampire (mostly thanks to Anne Rice). Because of that, I tend to blend romanticism with everything I write. I also try to give my locations and settings enough life for them to be considered a character themselves. 6. Your bio also says that you want your work to be controversial enough to make people think. What kind of thinking were you wanting to encourage with the Sins of the Father series? What kind of themes do you plan to pursue in future work? If nothing else, I want to dispel stereotypes. Let me explain. Every person, even the most deplorable, is still a person. Something made them that way. For example, some people in our society believe that anyone who is a terrorist is the epitome of evil and deserves no regard. But what drove that person to become that way? What hopelessness made them susceptible to their cause’s brain-washing? So many people do not ask those questions. They just brand and condemn. It disgusts me. So I’ll create characters that the reader falls in love with, and then have them reveal something utterly horrible about themselves. Will my readers continue to love them? Will they condemn the actions instead of the person? Or will they suddenly hate the character and put the book down? What they do, and if they think before doing it, will say a lot about them. I won’t apologize for anything I write, no matter how much it offends someone. Every human being has a story, and that story needs to be told. 7. You’re planning a Halloween release party for your next book. Ideally, what would that look like to you? As this is my first launch party, I have no expectations. Something voodoo themed would be lovely. 8. Did you put any of your series to paper while listening to music? If so, what kind, which artists, what songs? 9. Outside of your writing career what does your life look like? Do you have hobbies or interests that you’d like to share with your readership? I am happily married to my wife of going on nine years. I work from home during the day and write at night. Sometimes I meet friends for coffee or beer, but never coffee and beer. That’s an important distinction! My biggest out of office activity is my Writing Workshop. It’s a video workshop I started in 2012 and let stall out due to lack of equipment. I am thinking of setting up a Kickstarter campaign to get better equipment. It’s hard to teach writing techniques when you’re recording on an iPhone! As for hobbies, I am an avid gamer. That’s both video games and role-playing games. I have a BS in Video Game Design that I’ve never used professionally, but I design game mods and develop indie games all the time. Yes, game development is a hobby for me. I love martial arts and am a sword collector. 10. If there were one thing you would want your fans/readers to know about you, what would it be? Someone once expressed concern about my mental health because of some of the scenes in The Bourbon Street Ripper. I want to say that it’s just a book: I don’t endorse any of the horrible things my characters do! 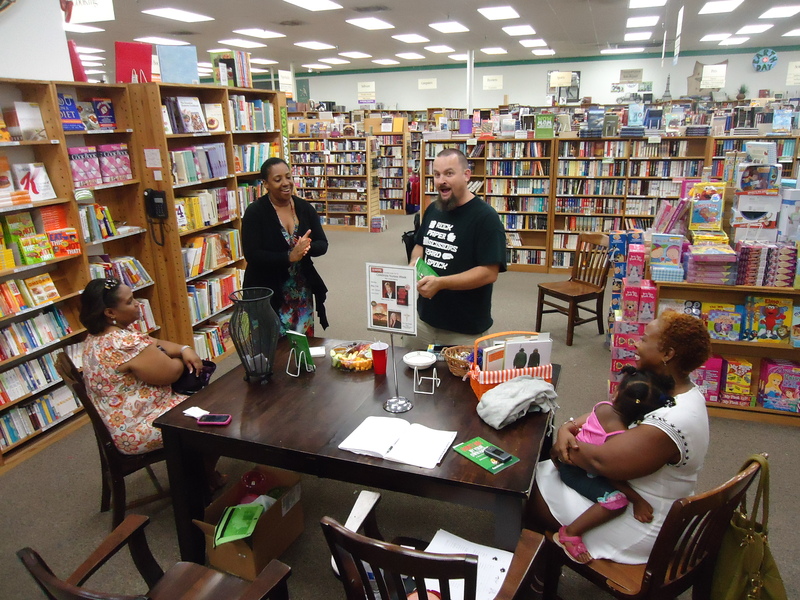 Leo King, second from the left in the black shirt, interacting with fans at one of his book signings. 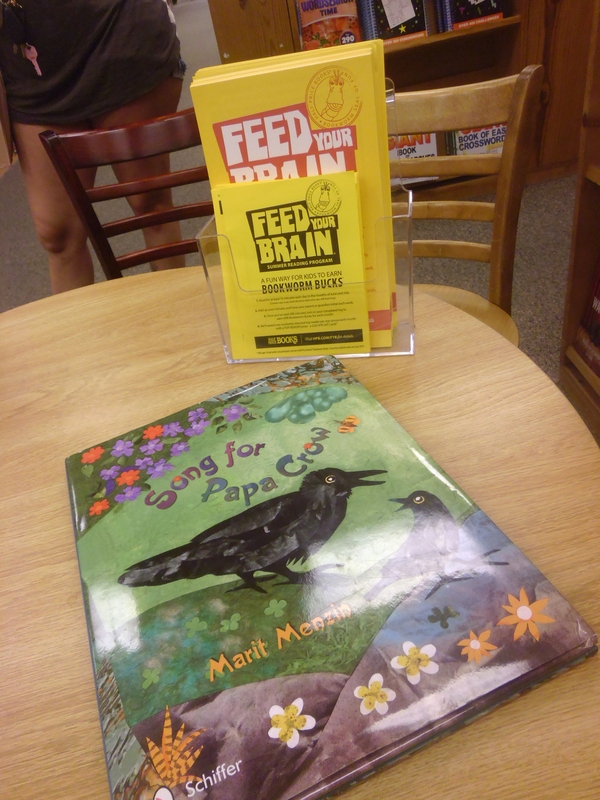 Along with the story time kids, I had the opportunity to interview the author of Song for Papa Crow , Marit Menzin. I love animals and nature, and I’m childlike in the sense that I always keep asking questions. I live in Lexington, Massachusetts where I see most of the birds featured in Song for Papa Crow in my backyard. The idea for my book came to me when I helped one of my children with a school project on birds. When I discovered that father crows take care of their offspring longer than most other birds, and that the whole flock would come to help a wounded crow, I asked myself: What would happen if a little crow was teased by songbirds for his unique song? And, what if in his quest to make friends he learned the other birds’ songs, but when he was in danger his father wouldn’t recognize his song? This idea is not farfetched, as I learned to my surprise that crows can mimic sounds made by animals and other birds, as well as sounds made by humans. When I wrote my story I wasn’t thinking about morals, but there are many morals that I subconsciously conveyed: Every child is special, and every child has unique gifts. Be proud of your family, and with who you are. It’s a good idea to tell your parents where you’re going, and whom you’re hanging out with so they’ll know where to find you. Your family loves you no matter what. Your family is the most important thing. Yes. Papa Crow will ALWAYS save Little Crow when he hears his voice. For Papa Crow, Little Crow’s voice is the sweetest thing in the world. I made the singing scenes because the birds I see and listen to in my backyard inspired me. I also thought that it would be fun to research bird songs and rituals. 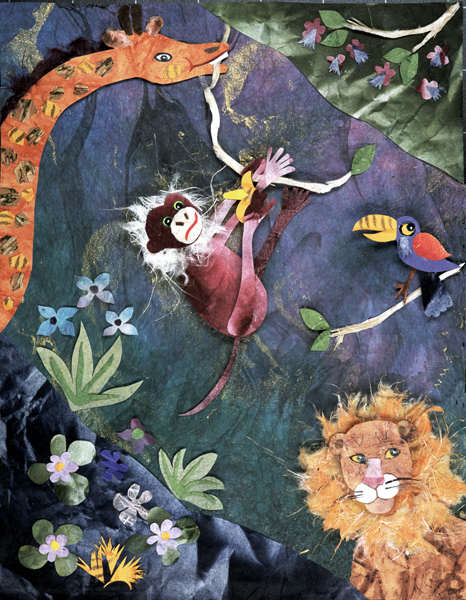 Although Song for Papa Crow is a fiction picture book, the story line is based on true facts. 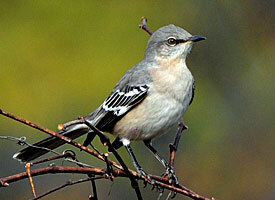 The mockingbird is a great singer who can imitate the sounds of other birds, and is also one of the few birds that can be heard singing at night. 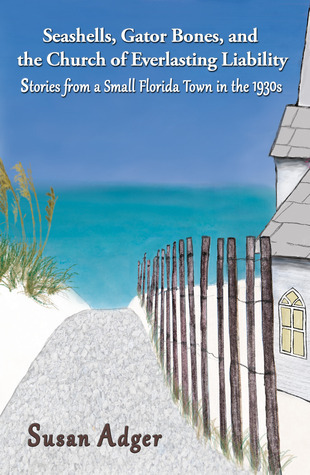 I heard of Schiffer Publishing from a local author I ran into when my art was exhibited at my local library. What inspired your collage art? It’s a very unique way to illustrate. I doodled and painted since my early childhood, and I experimented with different art media including oils, and pastels. But I only started developing my collage technique when I took classes with the Caldecott award-winning illustrator Ilse Plume at the deCordova Museum. I see that you are a freelance collage artist. You do book covers for hire? What sort of cost would an indie author be looking at? I designed the cover for my book. In general, a cover price can range anywhere from $150 to $4000 but an Indie Author could pay $250-$1000 depending on what she’s looking for and how much work is involved. Do you have more kids’ books of your own in your future? I’m currently working on the illustrations for a new book. I see you do school visits. What would it take to get you to Texas? 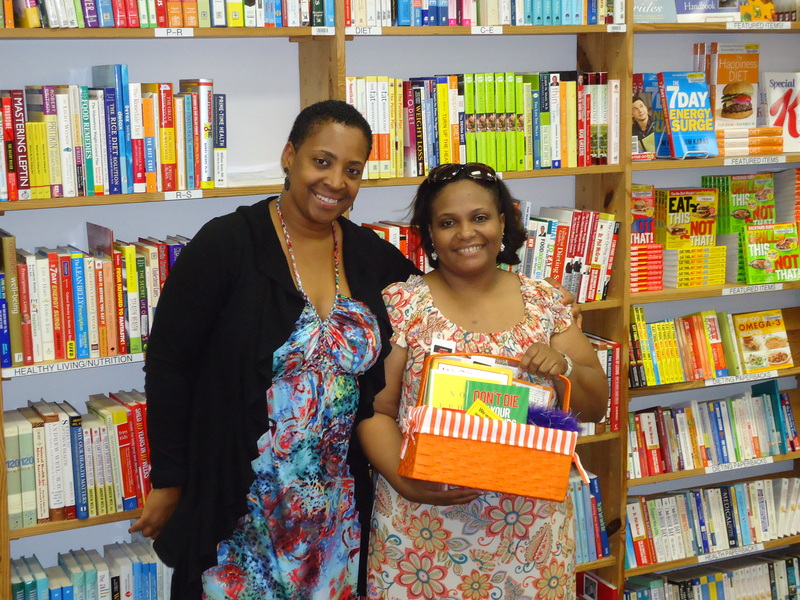 Author, Coach, Mother, Wife and Mentor Reeshemah Holmes passed away this week. A little over a year ago, I had the pleasure of meeting her in person. 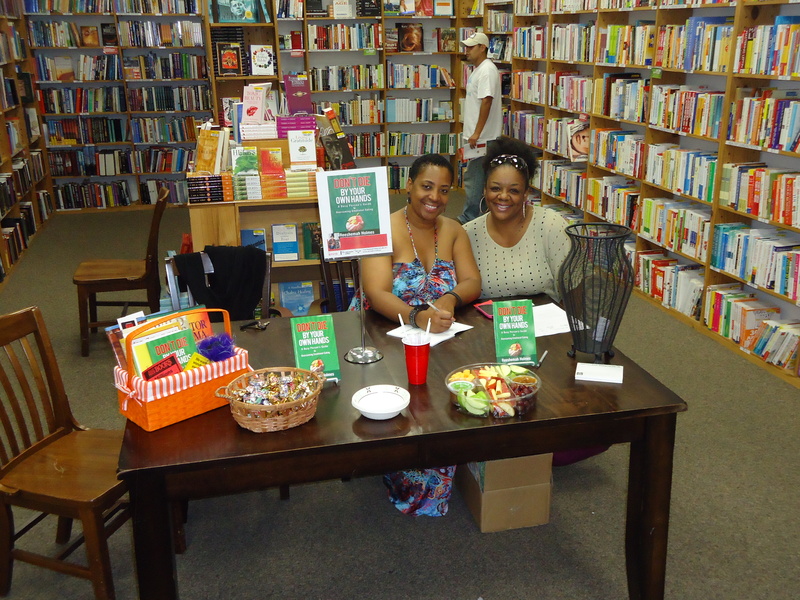 We coordinated a book signing at Half Price Books together where I was introduced to her friends, her students, and customers. I had the pleasure of reviewing her book for this blog, read it here. I am not close to Reeshemah, I only met her a few times. I enjoyed her company and her book. In the time that I spent with her I saw that she radiated excitement for life and encouraged a wholesome existence to all she came in contact with – from the inside out. She taught eating right as well as thinking right. She spoke of her Lord often and seemed to wish that everyone could come to live healthily and happily. That being said, I have not been privy to the information regarding her death, so I do not want this to be construed as an obituary of any kind. I do want to direct anyone searching my blog for information (her name came up a lot in my search history this week) to her website. There is a notice there regarding the family’s wishes and request for donations in lieu of flowers to help cover costs. That website is here. For friends and family, as well as the public who missed the opportunity to meet her, I’d like to make these photos available. I don’t believe I had the pleasure of ever taking a picture with her, I always thought I’d have another chance as I intended on booking her for another signing. 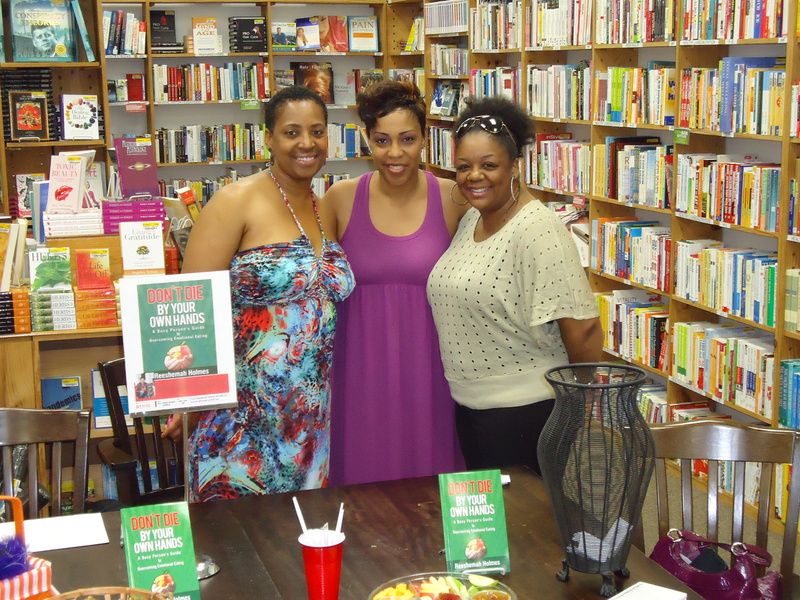 She was a joy to have in the store and the customers talked fondly of her presence afterward. I had a signed copy of her book, but someone else I knew needed to read her worldview and mantra for themselves and I loaned my copy out. She has left behind quite a legacy. My prayers are with her family and I hope yours are too. Download her book to your kindle, or purchase a paperback, here: Don’t Die By Your Own Hands . I had the pleasure of meeting author Wayne Basta awhile back for a book signing at Half Price Books Humble. 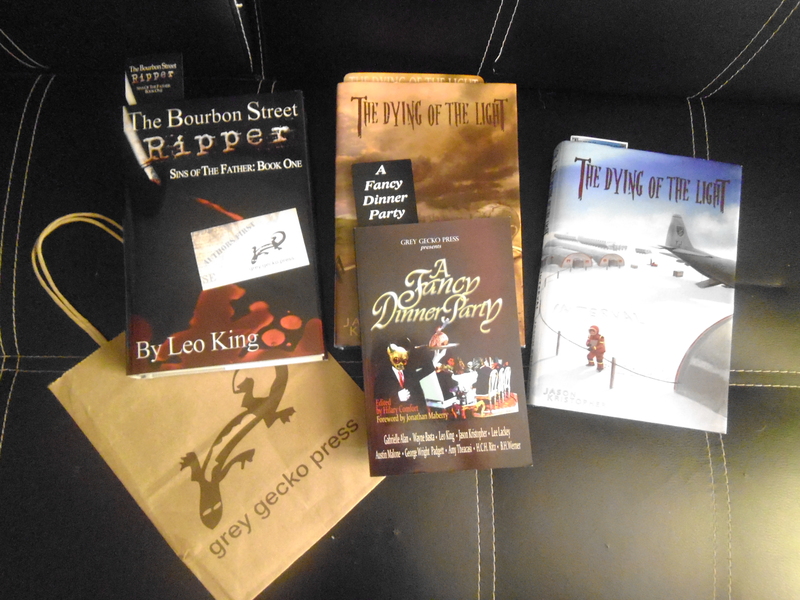 He has a three part series published under Grey Gecko Press here in the Houston area. This week, I finally had the pleasure of interviewing him. 1. I haven’t had the pleasure of reading your series. Can you tell us about it? 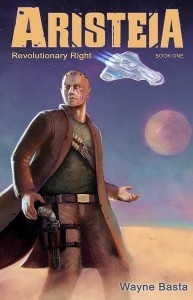 Aristeia is a science fiction space opera that follows the characters of Maarkean, Saracasi and Zeric as they accidently set off a rebellion against the powerful Alliance. 2. What moved you to start writing science fiction? I’ve always been a fan of the genre. My father got me into Star Trek and Star Wars at a young age and then followed it up with classic science fiction books like Asimov and Clarke. 3. An interviewer (Sam Weller, of the Paris Review) asked Ray Bradbury if writing science fiction satisfied something that mainstream fiction did not. I’d like to ask you that same question. Do you find that science fiction satisfies something that mainstream fiction cannot – both in yourself as well as in society? I don’t believe science fiction isn’t mainstream fiction. Look at the biggest blockbuster movies and books and you’ll find lots examples of science fiction. Science fiction certainly satisfies something other genre’s do not, but so does every different genre. 4. When did you start writing? Have you always wanted to write? The first things I wrote were when I was 9 and we got our first home computer. I dabbled in writing ever sense then, though I didn’t make a serious effort to write a complete novel length story until just a few years ago. 5. When you write, do you have a specific place or environment you like to go? Do you play music (and if so, what music?) or do you prefer the quiet? I usually write from my laptop at the kitchen table. The chairs are less comfortable than my desk chair so its easier to stay focused. The laptop also can’t run most of my games so that clearly defines this computer a work place and the desktop for play. I write in silence a lot but depending on the scene I’m working on I might put on music. I’ll often try and match the music to what’s happening in the book. During a heavy battle scene I might play some epic sound tracks from movie battles or if its more subdued a lighter piece. 6. What is the easiest part of the writing process for you? What is the hardest? The easiest part is the writing itself. Figuring out what I’m going to write, finding the time when there’s no toddler demanding attention, marketing the books, editing the grammar and everything else is hard. But when I know what is going to happen to my characters, the words just flow out with ease. 7. Who designed your book covers? I worked with an artist named Oliver Wetter to design the cover. I told him what I had in mind and described the looks of my characters. He then brought them to life. He did an amazing job with each of them. 8. You were recently at a Comicpalooza. What were you doing there? What was that experience like? 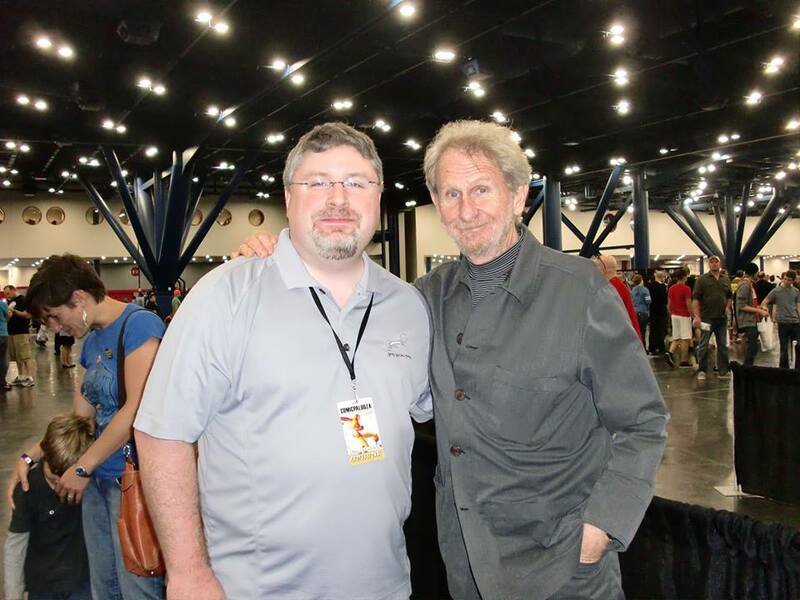 I sat on a number of writing panels at Comicpalooza. 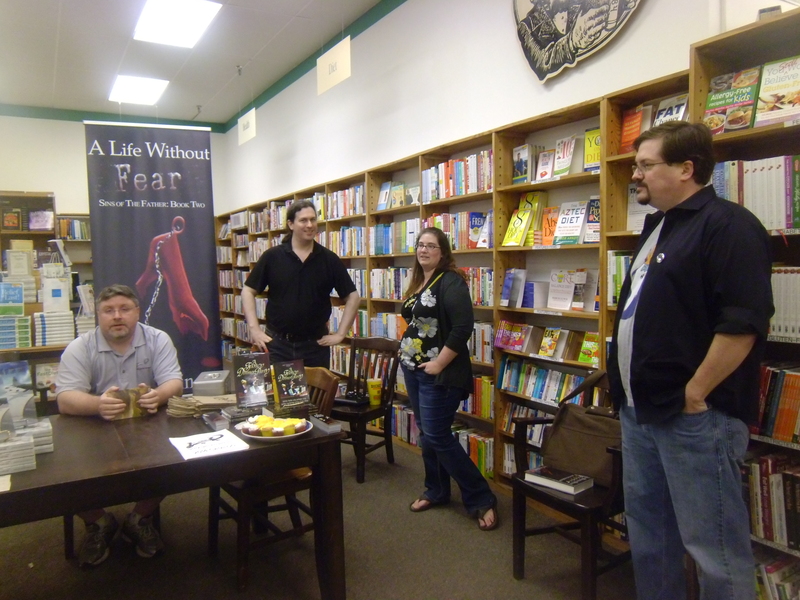 It’s always great to get to sit down and talk about writing and books with fellow authors and fans of the genre. 9. Do you have any tips or advice on getting published for aspiring authors? Never give up, never surrender. It’s a hard process to wade through and relies mostly on persistence and dedication to succeeding. Keep trying and keep improving your queries and your writing. Like Wayne’s page on facebook. 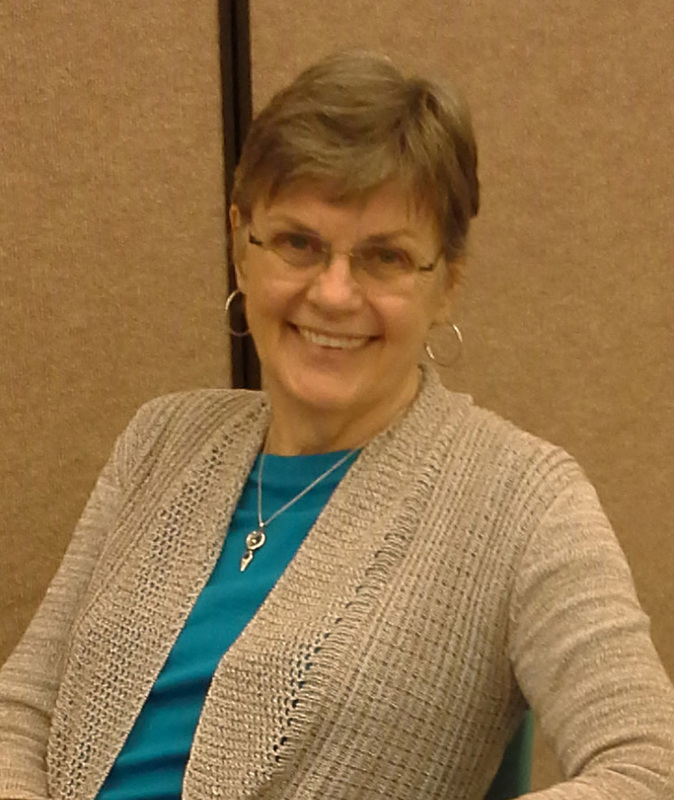 I love doing author interviews, especially for authors whose work I have read and enjoyed. 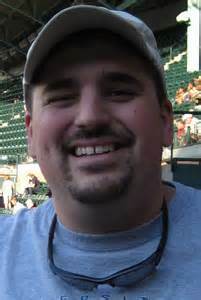 Please allow me to introduce to you John Oehler. Below is an interview in which he was kind enough to participate. 1. 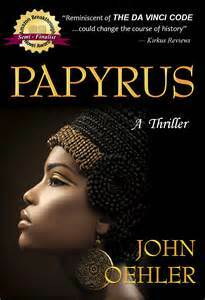 I read Papyrus and Aphrodesia and was riveted by both. You have a knack for mystery and detail, whether historical or well-researched professions like perfuming. What inspired you to write these stories? The initial idea for Papyrus came to me in 1983 when I was in the Egyptian Museum in Cairo and noticed a potential way for thieves to break in. Over time (by which I mean decades, because I was not yet a serious writer), the story concept expanded tremendously. The theft now occupies only a chapter and a half. Interested readers can see my original sketch of the break-in route by going to http://johnoehler.com , pulling down Papyrus from the Novels tab, and clicking on Behind the Scenes. Aphrodesia is another story that took years to mature. 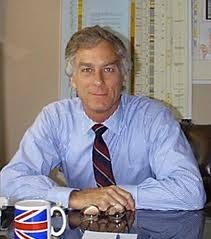 I first became interested in fragrances while living in London in the mid-80s. I started collecting perfume samples, perfume books, and articles on the psychology of scent. I wanted to write a story centered on fragrances but couldn’t think of an interesting plot — until I met a master perfumer in Versailles who told me that creating a true aphrodisiac is the Holy Grail of the perfumer’s art. I thought: Bingo! I can make a story out of an aphrodisiac. As with Papyrus, you can read more about the origin of Aphrodesia on my website. Pull down Aphrodesia from the Novels menu, click on Behind the Scenes, and you’ll see two entries illustrated with photos of the master perfumer and of ISIPCA, the perfume school in Versailles where the story begins. Papyrus was a semifinalist in the 2009 ABNA competition, ranking in the top 1% out of 10,000 submissions. I was thrilled. At the same time I was disappointed, because the Publishers Weekly reviewer praised everything about the story except for the “downbeat” ending — a major character died. It made me wonder if a more upbeat ending might have advanced Papyrus into the finals. I knew, from critique partners and others who had read the story, that opinion was divided about 50:50 between those who loved the last chapter and those who didn’t. Ultimately I decided to change the ending. As an aside, I have toyed with the idea of posting the original ending on my website. But beyond those who read this interview, very few people are even aware that the current last chapter was not my first choice. Winning the PNWA competition was probably the biggest surprise of my writing career. It’s a major contest that attracts lots of agents and editors. 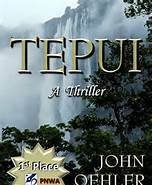 I’d entered a thriller titled Tepui and received a hint that it might be a finalist. At the award ceremony, I was sitting at a big round table with my wife and about ten other people as the finalists were read off. When my name was announced as the winner, I blurted, “Are you shitting me?” The whole table laughed. Perhaps the coolest thing was that this led to a role reversal. Like most unpublished writers, I’d endured years of frustration playing supplicant to the deaf gods of agentdom. Now, suddenly, agents were courting ME. In the end, the agent I signed with turned out to be a poor choice. Several months into our relationship, she sold a YA fantasy for half a million bucks and a second YA fantasy for a quarter million. She lost interest in thrillers. 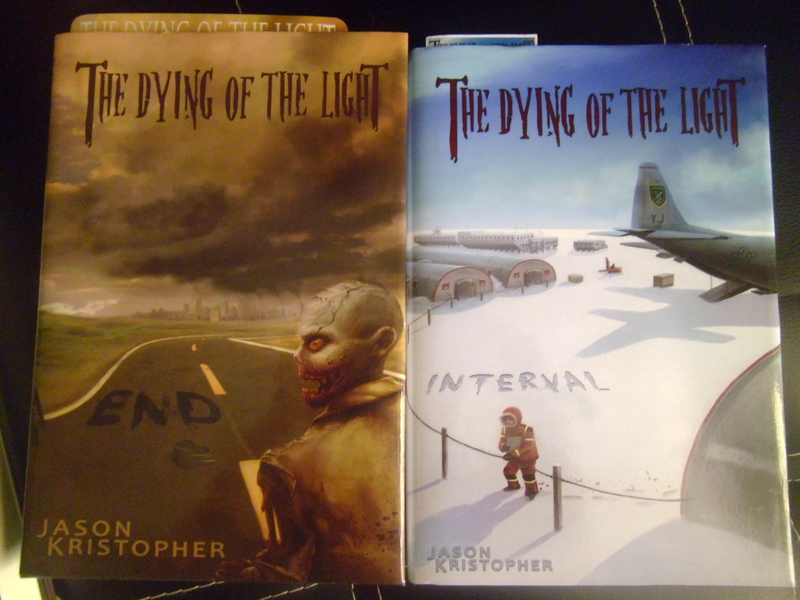 On the flip side, I lost interest in agents and have been more than happy to self-publish ever since. Secret to success? I’m certainly not as “successful” as I’d like to be. But I attribute my modicum of popularity to excellent teachers (like Chris Rogers) and critique partners I trust and respect. I strive to create unusual characters, take them to places most readers have never seen before, and keep readers guessing what’s going to happen next. I also try to engage all of the senses, to help readers feel like they are in the story, not just reading it. 3. I’ve posted reviews for Aphrodesia and Papyrus here on my blog, but I haven’t had the pleasure of discovering Tepui. Can you tell us a bit about it? Tepui is the story of a burn-scarred botanist who treks into the remote Venezuelan highlands in search of a living fossil but stumbles onto something far more astonishing, and deadly. This story stems from my work and travels in Venezuela and on the history of the region. 4. Tell us about your other writing ventures. What other brilliant ideas have you got up your sleeve? When can we expect to see your next book? Tepui will be the next book I publish. I’m currently refining it and hope to get it out by the fall. I’m not sure what will come after that. I’ve always loved old books and libraries. While visiting a monastery in Prague last Christmas, I spent an hour contemplating their library and especially their locked collection of forbidden tomes. I’d like to set a story in that environment. The idea might sound derivative of The Name of the Rose (one of my all-time favorite stories), but I would set it mainly in modern times. In a similar vein, I’ve long wanted to write a story set in western Ireland during the Viking raids of the early 900s. It would center on a mixed male-female monastery with a round tower that serves as a repository for volumes rescued from the anti-intellectual book burnings of the Dark Ages. I’m torn between this and the Prague story. I don’t think I can do both, because there’d be too many similarities. I’ve written parts of several other stories I’d like to expand if I live long enough. One centers on a powder created by an 8th-Century Arab alchemist (a real person) that extends life for centuries, provided you keep taking it. The story opens with the spectacular (true) robbery in 1976 of a bank in Nice, during which thieves spent an entire weekend looting safe deposit boxes in the underground vault. In my twist, the thieves were working for a woman who knew the powder and the alchemist’s formula were in one of the boxes, and that’s all she wanted. Most of the others involve things like ancient mysteries and labyrinthine puzzles. 5. What got you started in the writing world? Have you always wanted to write or is it a passion you discovered later in life? In high school I wrote poetry about society’s outcasts, some of which was published in a scholastic magazine. In college I occasionally ghostwrote sonnets for girls who were supposed to write them as a class assignment. Simple rhyming poetry always came easily to me. What started me writing novels — or trying to — was hubris. In the late 70s and early 80s, I traveled internationally quite a bit and spent my time on planes reading Robert Ludlum novels. After a while, I thought: I can do better than that. In retrospect, I’m pretty sure my attitude came from the fact that (as he admitted later) his stories all had the same plot. So on that trip to Egypt when I got my initial idea for Papyrus, I decided to try my hand at writing a book. Little did I know. Exit all traces of hubris, never to return. Enter the long, hard slog of learning to craft stories that OTHER people enjoy reading. 6. Your writing style is truly unique; I’ve never read another quite like you. Who are your favorite authors to read? Who inspires you? Interesting that you should mention my “style.” I was once told that I don’t have a style. In truth, I don’t think about it when I write. But when I proof a story, I do notice a lot of “habits” that surface on every page. Modern authors I enjoy reading include Ken Follett, Michael Crichton (before his stories became political), Umberto Eco, Nelson DeMille, Daniel Silva, Trevanian, Frank Herbert, Stieg Larsson, Wilbur Smith, Elizabeth George (her earlier books), and Laura Hillenbrand (a monument to writing beautifully under major adversity). Sadly, several of these authors have left us. If I had to pick one author who inspires me, it would be Michael Crichton. As a scientist, I like the way he turns science into adventure and often combines that with history. My own stories do the same. 7. Your ‘on location’ scenes in your books are so detailed. Have you traveled to the places you write to describe them so vividly? What a wonderful compliment. Thank you. Yes, I’ve traveled to many of the places I describe: Egypt for Papyrus, France for Aphrodesia, Venezuela for Tepui. In fact, I’ve traveled to fifty or sixty countries and lived in six. But there are places in my stories I have not visited. Two examples are Yemen in Aphrodesia and Sudan in Papyrus. For these I used my experiences in Somalia, combined with books and articles I have plus a lot of Internet research. 8. Other than writing, what are your other hobbies and interests? I read a lot, of course. I love to cook. And my wife and I continue to travel as often as we can. She’s a member of the Mars Science team, which operates and analyzes data from NASA’s Curiosity rover, so our travel opportunities are limited by the rover’s activities. But we manage to get away frequently and always enjoy the foods, wines, art, music, and history of the places we visit. 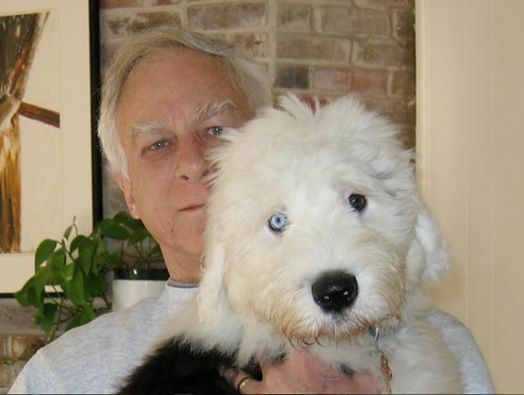 Then there’s our Old English Sheepdog, Elfie, who has her own Facebook page (https://www.facebook.com/elfie.oehler) and takes a chunk of my “spare” time. As to interests, name something, and I’m probably interested. I have files on everything from art, poisons, labyrinths, and magic to ancient and medieval history, symbology, gold, gypsies, and food. Probably I’m most interested in things that influence the way we think and behave, especially early Catholicism, medieval Islam, taboos, superstitions, and the like. 9. If there is one thing you’d want your readers and fans to know about you, what would it be? My whole reason for writing is to please my readers and make them hungry for more of my work. I want to share with them the excitement of exotic places, the richness (and sometimes terror) of foreign cultures. And (don’t kill me for saying this) I try to educate by painlessly integrating elements of history, art, and science. I love it when readers say, “I never knew that.” And I love it even more when they wonder, Could this really happen? 10. 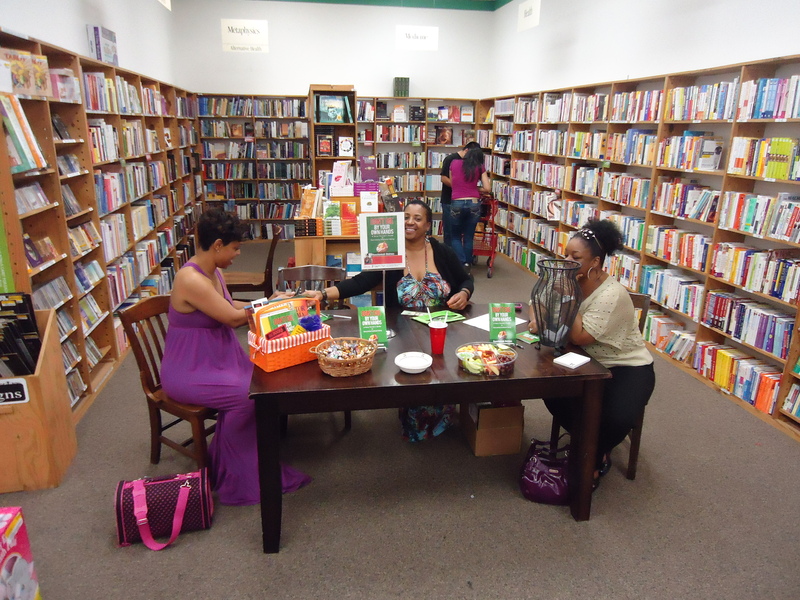 Previously you have participated in book signing events in the Houston area. When (and where) can we expect to see you out and about again? Nothing scheduled at the moment. But when Tepui comes out, I hope to have several signings. I’ll definitely let you know. 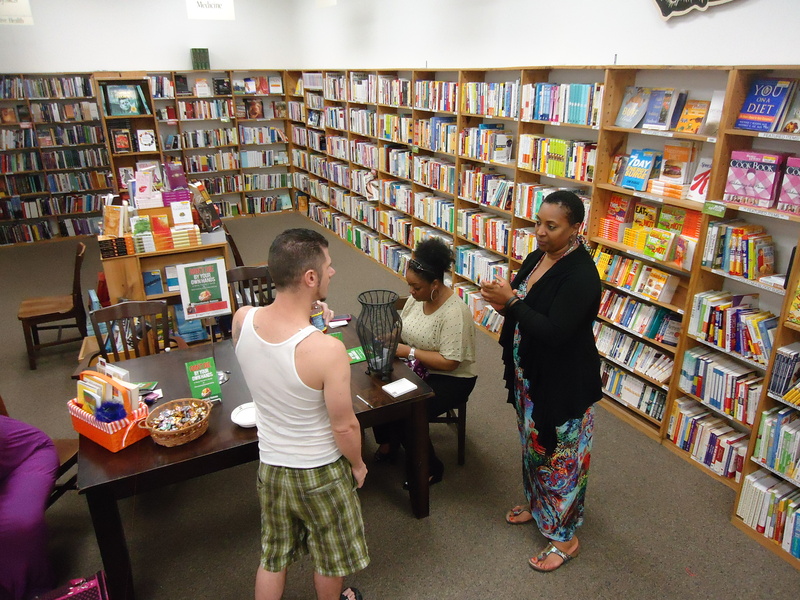 Signings offer a unique opportunity to speak personally with potential readers, and I look forward to the next round. And The Tour Goes On.